You can set up and change product limits for a single account or for an account group. If an account belongs to an account group, only the account group settings are used. Account and Account Group risk requires TT Gateways 7.17 and later. Note: You can also create product limits per Gateway Login. For more information refer to the Creating Product Limits for Gateway Logins topic. When configuring product limits for an account or account group you can determine which products are tradeable, specify various limits on maximum order size and position per product, configure pre-trade price controls (refer to Account-level Price Controls ), and configure additional margin per product. Note: Account-based product limits do not have a Trade out allowed option like Gateway Login-based product limits. Traders can always trade out of account positions. This procedure describes creating product limits from the Account Group window (the same procedure applies when creating product limits from the Accounts window). From the User Admin window, select Account Groups to manage product limits for an account group. From the Account Groups window, create or edit an account group. If you have assigned accounts to an account group, you can also edit that group by selecting any assigned account in the Accounts window and clicking Edit Account Group. The Account Group window appears. In the Product Limits section, click New. Note: To copy one of the product limits listed in the Product Limits table, select the product limit and then click Copy. The New Product Limit window appears. Select or enter a value in the applicable fields as needed. Account Group: Specifies the account group to which the limits apply. Gateway: Specifies the gateway to which the limits apply. Check the Show all gateways option to populate the Gateway drop-down with all gateways. Product type: Specifies the instrument type (e.g., Future or Option) to which the limits apply. The type selected becomes the name of the first tab in the window. For Intra-product Spreads or Strategies, you use the same product limit to define the settings that are applicable to both the product and to any spreads or strategies for the product. For example, you can create a single product limit for GE futures that includes limits for any spreads or strategies that contain GE future legs. 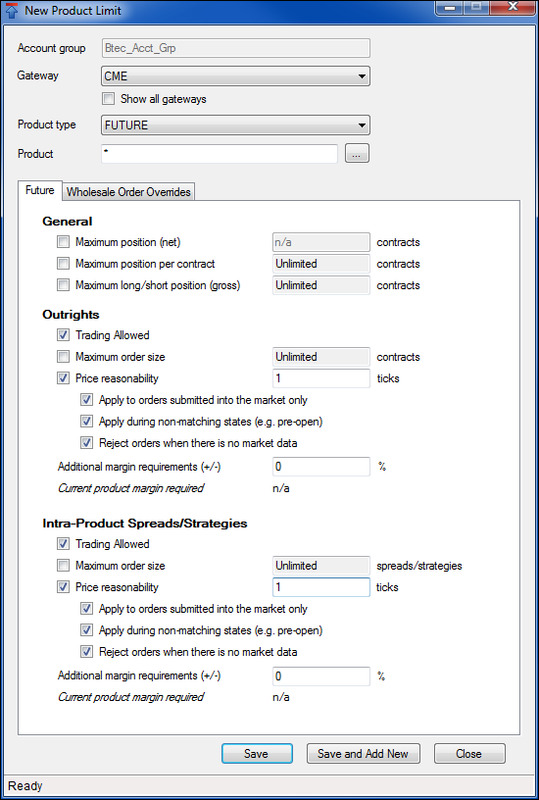 For Inter-product Spreads or Strategies, you define a separate product limit for the Inter-product Spread or Inter-Product Strategy (which allows you to configure maximum order size and price reasonability limits), and separately, you define position limits for the products that make up each leg of the spread or strategy. For example, GLBGE is an inter-product spread consisting or GLB and GE product legs. To configure GLBGE limits, you would create a product limit for the GLBGE Inter-product Spread, as well as product limits for the GLB Future and GE Future. When trading GLBGE, the position limits configured for the GE and GLB future will apply, and max order size from the GLBGE product limit will apply. Product: Specifies the product (e.g. FGBL ODAX, etc.) to which the limits apply. An asterisk indicates that the limit applies to all products of the specified product type, unless an additional product limit exists with a specific product. For example: Assume you have two product limits configured for the CME-A Gateway: for one limit the product is * (all products) with a maximum position of 10, and for the other limit the product is ES with a maximum position of 5. When trading ES, the account is limited to a maximum position of 5, and when trading all other products on the CME-A Gateway, the maximum position limit is 10. Maximum position (net): Limits an account to an overall maximum long or short position per product. For example, if this limit is set to 5, and an account is long 2 GE March contracts and short 4 GE September contracts, then a sell order greater than 3 or a buy order greater than 7 in any contract month would be rejected as it could potentially result in a long or short position greater than 5. Note: Traders that only trade calendar spreads will never reach this limit because their positions in one contract offset the positions in another contract. Maximum position per contract: Limits an account to an overall maximum long or short position per contract for a product. Maximum long/short position (gross): Limits the worst case total of long or short contracts per product. The sum of the long positions in all contracts cannot exceed this limit; nor can the sum of the short positions. For example, if the limit is two, and these is a long position of one in one contract and a working buy of one in a different contract, then no more buy orders can be places. Trading Allowed: Specifies whether outrights for the product in the product field can be traded (e.g., the Future, Option, Stock, Bond, or Energy). If you plan to restrict trading in this product but allow trading for specific contracts for this product, leave this option unchecked. Maximum order size: Specifies a limit on the maximum individual order size that can be entered for the outrights of a specified product. Price Reasonability: Determines how far from the market price a user may enter an order (in ticks) for the outright. If you only want to enforce this setting for buy orders above the limit and sell orders below the market, check the Apply to orders submitted into the market only option. To reject orders when there is no market data regardless of whether or not the market is in a matching or non-matching state, check the Reject orders when there is no market data option. The default is to allow orders when there is no market data. Additional Margin Requirements: Specifies a percentage above or below the margin that a trader must have to trade the product. In other words, additional margin increases or decreases the margin requirement when calculating risk limits. The current margin for the specified outright is displayed in the Current product margin required field. Trading Allowed (spreads/strategies): Specifies whether the spread/strategies for the product in the product field can be traded. If you plan to restrict trading of this product but allow trading for specific contracts for this product, leave this option unchecked. Maximum order size (spreads/strategies): Specifies a limit on the maximum individual order size that can be entered for the spreads or strategies for a specified product. Price Reasonability (spreads/strategies): Determines how far from the market price a user may enter an order (in ticks) for spreads or strategies. If you only want to enforce this setting for buy orders above the limit and sell orders below the market, check the Apply to orders submitted into the market only option. Additional Margin Requirements (spreads/strategies): Specifies a percentage above or below the margin that a trader must have to trade the spread or strategy. In other words, additional margin increases or decreases the margin requirement when calculating risk limits. To edit the margin for the specified spread/strategy, click the Update spread/strategy margin button. Note:Use the Save and Add New functionality to add many similar limits. The limit you created appears in the Product Limits section. To enable the product limits, check the Apply product limits option. Account-level pre-trade price controls are configurable on the New Product Limit window when configuring Accounts and Account Groups. If you check this option, you set a directional range. Buy orders must be below the maximum price, and sell orders must be above the minimum price. Orders submitted outside the defined price band or will be rejected in all TT order routing applications. If you uncheck this option, you set a static range. Buy and sell orders must be within the configured price band. Orders submitted outside the defined price band will be rejected in all TT order routing applications. To apply price reasonability during non-matching exchange states, check the Apply during non-matching states (e.g, pre-open) setting. When applied, the price check uses the indicative open price as the market price, otherwise, the price check uses the first available price from the last/close or settle, in that order. If none of these prices exist, then the algorithm assumes there is no market data at all, and allows or rejects the order based on the Reject orders when there is no market data option. To reject orders when there is no market data, regardless of whether or not the market is in a matching or non-matching state, check the Reject orders when there is no market data option. The default is to allow orders when there is no market data. Spreads and Strategies that have legs in different products (e.g., GE and GLB) or different product types (e.g., a Future leg and an Option leg) are inter-product spreads/strategies. When configuring risk for inter-product spreads/strategies, create a product limit for the Inter-product Spread or Inter-product Strategy that allows or prevents trading, sets the maximum order size, and sets price reasonability, as needed. To apply position limits, create product limits for each leg of the spread/strategy (for example, ZI Future and OZI Option) and set the General limits. Product type: Select INTER-PRODUCT SPREAD. 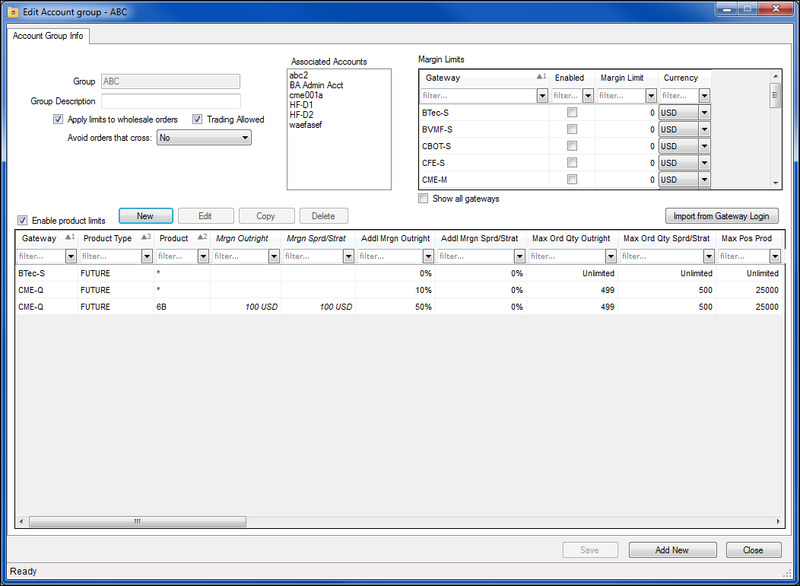 The New Product Limit window displays the Inter-Product Spread tab. Product: Specifies the inter-product spread/strategy (e.g. GLBGE) to which the limits apply. An asterisk indicates that the limit applies to all products of the specified product type, unless an additional product limit exists with a specific product. Trading Allowed: Specifies whether the spread/strategy in the product field can be traded. If you plan to restrict trading in this product but allow trading for specific contracts for this product, leave this option unchecked. Maximum order size: Specifies a limit on the maximum individual order size that can be entered for the spread/strategy product. Price Reasonability: Determines how far from the market price a user may enter an order (in ticks) for the spread/strategy. If you only want to enforce this setting for buy orders above the limit and sell orders below the market, check the Apply to orders submitted into the market only option. To apply position limits, create product limits for each leg (for example, GLB Future and GE Future) and set the General limits. Refer to Creating Product Limits for Accounts and Account Groups .